Welcome to The Bardic Blog! 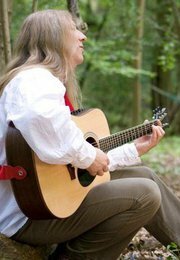 My name is Damh the Bard, I am a modern Bard/Singer/Songwriter/Druid who tours the world playing music at festivals and events. I am the Pendragon of the Order of Bards Ovates and Druids (OBOD), and run the Anderida Gorsedd with my partner, the Pagan artist Cerri Lee. Here I’ll be writing regular articles about my main interests – myth, music and Druidry. I post at least once a week, so there’ll always be something to read. So you can either subscribe to the RSS feed on the front page, or get email notifications from the email sign up form. Hi Damh, I love your stuff and love the podcasts, truly inspirational! I was at the Spirit of Albion play performed yesterday at Witchfest Croydon, and it really helped me, a novice, in my quest to understand a little more about the pagan ways, and helped me really understand your songs propoerly, in a way I had not before. Thank you from the bottom of my heart, this has made a huge impact which I will take some time to understand. Hi Dave/Damh, after listening to nothing but your works for the past 3 weeks (since I discovered your talents) I just had to write n say thankyou! I love your treatment of the subjects, your musical talents and the humour, emotion and passion which shines through your performances! PLease keep it up! Have to say I like your first album the best, the raw power and the simpler arrangements really work for me! Anyhows, I got some inspiration to write you a tongue in cheek poem for a laugh, I hope you take it in the spirit its meant, and enjoy my poor verse for what it is! Damn the Bard, Damn him I say! Storytelling and singing for all of the day! He engages my mind and emotions he strips! His lessons we learn, those stories do shine! He takes me to places as though I was there! He journeys the land, putting foot not wrong! He’s welcomed all over with a hearty cry! Cos I’d love to be doing it the very same way! Lol, you are most welcome! I want you to know that it was your music that helped me to step onto my current spiritual path. Though often challenging, it has always been a blessing and I would never change a thing. I’m very glad I found your video that day. Thank you for making it and thank you for putting it out there for me to find. You have blessed me.